Greens Farms Academy senior captain Kate Mohr earned All-New England honors with an eighth-place finish in 21:49 at the New England Division III championships on Saturday at Westover School in Middlebury. Boys and girls cross country -- Greens Farms Academy's boys and girls teams saw its runners receive honors at the New England Division III championship races on Saturday at Westover School in Middlebury. 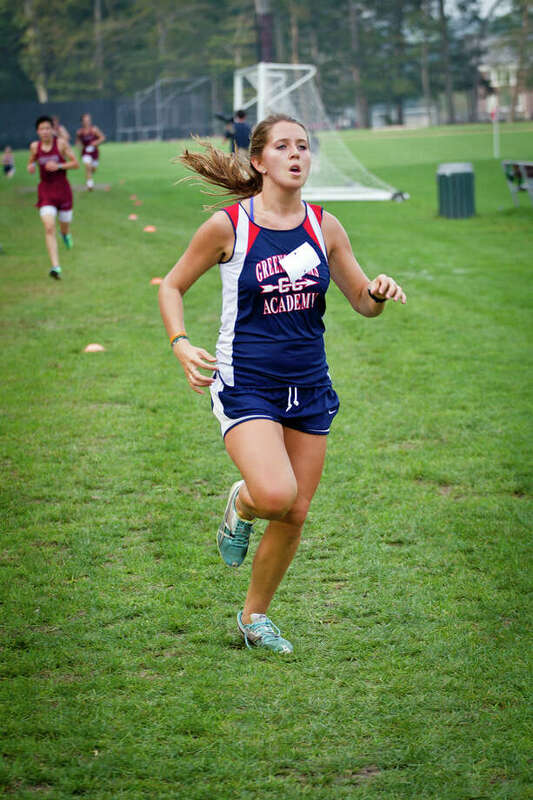 On the girls side, senior captain Kate Mohr finished eighth overall out of 146 runners with a time of 21 minutes and 49 seconds to earn All-New England recognition. The Dragons' girls team finished 12th out of 19 teams. Caroline Booth (23:28), Georgia Grellier (24:49), Crosbie Marine (25:37) and Delaney Sondag (25:59) rounded out the team's top five runners. For the boys, the Dragons' Kenner Clark landed in eighth place out of 136 runners with a time of 17:46. He also received All-New England honors. The Dragons finished second overall as Andrew Allison Godfrey (18:32), Andrew McCarthy (18:32), Luiz Machado (19:19) and Danny Ross (19:31) were the team's top runners behind Clark. Field hockey -- The Dragons closed out their season with a 3-1 win over Ethel Walker on Saturday. Junior Maggie Sherin opened the game by scoring off a penalty stroke in the first minute. Madison Leonard and Tade Waters each added a goal in the first half. The Dragons finished 10-6 and bid adieu to six seniors after the game: Leonard, Margot Bruder, Caitlin Rummelsburg, Ashley Hutchison, Liz McDermott and Jenn D'Agostino. Girls soccer -- The Dragons closed out the regular season on Saturday with a 3-0 shutout of Miss Porters. Senior Phebe Wong scored the lone goal of the first half with a shot from outside the 18-yard box. After receiving the ball from the midfield, Wong took two touches and ripped a shot to the far upper corner of the net, beating a diving goalkeeper. Sophomore Olivia Lennon scored with 12 minutes left in the second half. Just minutes later, 8th grader Lexi Kimball took the ball up the left side of the pitch, moved into the box and scored the match's final goal. Junior Caroline Kruk earned a shutout in the net for the Dragons.